Pups (especially elderly ones such as myself!) need knee protection if they’re to spend any time down on all fours particularly if it’s on hard floors. I’ve tried loads of kneepads over the years and they’ve all been somewhat lacking – either they slip off (hard to put back on if you have mitts on) or bunch up round the back of the knee. It doesn’t matter which ones I tried – whether they be hard BMX ones, builder’s style or even dedicated kink ones, they all suffered from the usual issues. 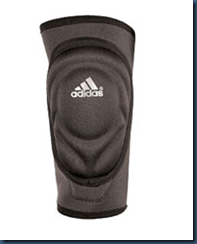 However, I’ve recently splurged on a pair of Adidas wrestling kneepads which work really well.